At last I am happy to announce that the 8hp standalone is up and running. Not only will this allow the factory tcu to operate on a completely standalone setup but it will also be able to work with older factory ECUs for swaps with older CAN messaging. The new crate kit ecus will be supported as well. There is a bit more work to do and harnesses to make etc before product is ready to sell. But the hard part is over. This is awesome news. I have a Nag1 behind a 5.7 in my 70 GTX. I am using a transmission computer designed abnd programmed by Russell and it is awesome! Great news for the 8 speed swap folks! Wonderful news. The 8 speed sounds like an awesome transmission. "The transmission can be used in a mild or full hybrid setup, and allows input torque up to 900 Nm, or 664 lb-ft (8HP90) — high enough for any Chrysler gasoline engine, not quite enough for the Cummins diesel." Sweet, but taking a look at the one in my charger it is huge! It's 30" long bell face to rear mount and still 9" tall at the mount. now just to make a mount to put it behind a big block. With an output to match up to a right hand drop np205 transfercase. 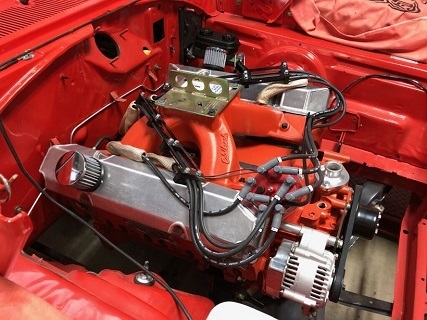 The 8HP90 has the Mopar small block bolt pattern on the bell housing - that is what I believe is true at least - someone please verify this please and help me out. I just took a look at the 8HP90 transmission in the flesh, but isn't the starter on the passenger side on this new 8 speed? I thought the original small block Mopars were on the driver's side - or am I missing something here? Is it possible to change the 8HP90 to the driver's side - or does the small block easily hook up the starter on the passengers side? One way or the other, trying to hook up an old LA type block or B or RB block is going to be really tough - or is this only possible with the newer Generation III hemis? I thought it would be cool to be able to hook up the old gear with this newer technology, but the starter position deal might be an absolute no deal situation. The starter is the deal breaker? Just make your harness longer. Very easy to do. Yes, Gen 3 have the same bell pattern as LA and Magnum blocks. If I was going through all the work of the TF-8 I'd be putting a Gen III in front of it, I wouldn't bother trying to mate it to an old engine. It's a play for efficiency, put a modern, efficient engine in front of it. It would probably die behind a big 2nd gen hemi! They are a great transmission no doubt. One thing to consider is that in stock form, the ecu cuts power for a few milliseconds when shifting. This reduces stress on the transmission. If I were installing an 8 speed in anything, I would want to make sure that I could still reduce power at shifting for longevity of the transmission.